I’ve been experimenting and deploying Azure Stack PoC since TP1 was released. Since then, lot of things changed, first with Azure Stack TP2 and later with TP3. Idea of running Azure like environment in my datacenter was amazing to me and I tried to test it right away. First, I had hardware issues as I had nowhere near hardware that would meet minimum requirements but after joining Authority Partners that has changed luckily for me. Still I tried to push limits and see how low can we go and still do deployment of Azure Stack. Extract files and you will get Azure Stack VHD file. Normally this would be used for booting your server but we will use it as base OS drive for our Azure Stack VM. So create new VM using downloaded VHD as boot disk and assign as much memory and CPU as you can afford. Boot your VM and make sure that disks you assigned are initialized. Now run PS script BootstrapAzureStackDeployment that is located in ‘C:\CloudDeployment\Setup’. This will download some additional files needed for deployment. To make sure our deployment can successfully finish, we need to edit some files. # Validate this is not a virtual machine. # Validate the number of cores on each of the machines meets the required minimum. Now we are ready to start deployment but you can edit some more things. 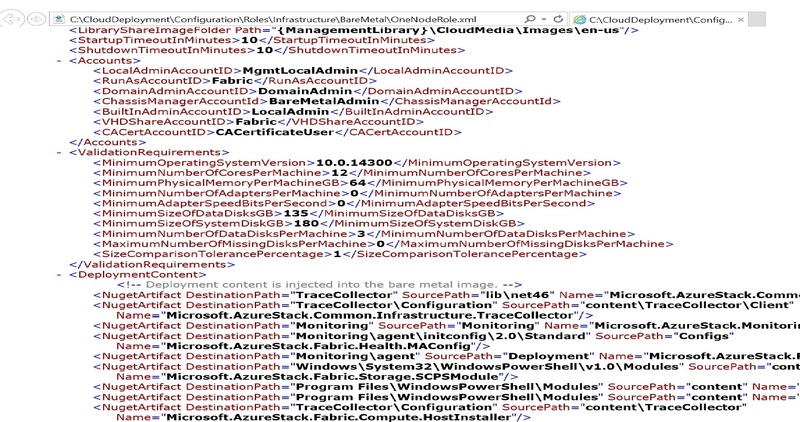 If memory or number of cores you assigned to your VM don’t meet requirements, you can edit file ‘C:\CloudDeployment\Configuration\Roles\Infrastructure\BareMetal\OneNodeRole.xml’. 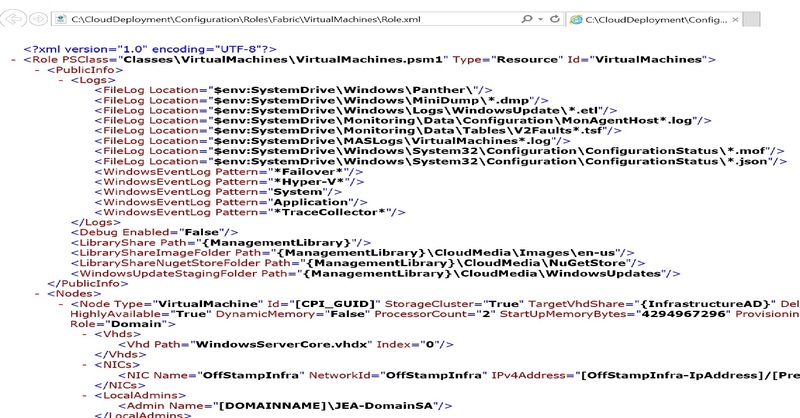 If you want to play with fabric and edit VMs that Azure Stack uses, you can edit ‘C:\CloudDeployment\Configuration\Roles\Fabric\VirtualMachines\Role.xml’. After installation starts, you will need to enter credentials for local admin and AAD admin accounts. Few hours later, if everything goes as planned, you will have Azure Stack deployed in your datacenter. Now, be aware that this is still PoC and that real thing is coming. 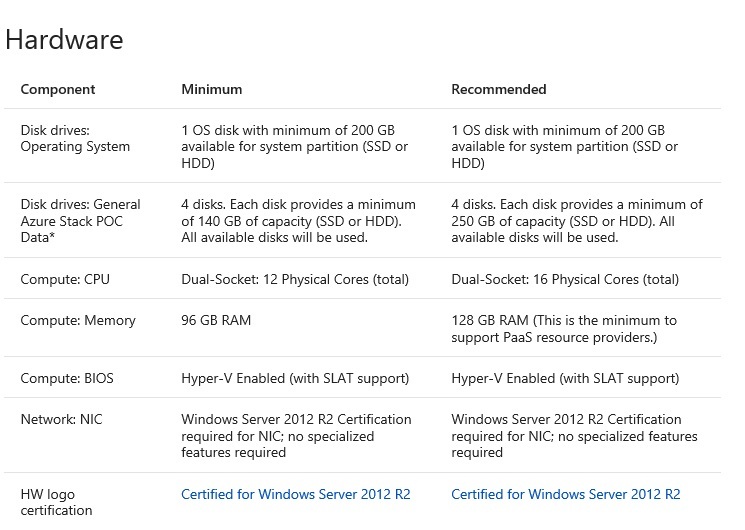 And yes, you can install Azure Stack on VM and even on lower hardware. Do I recommend you do that? Absolutely NOT! This is only for PoC and to see how it works. If you lower resources too much, you will not be able to do anything with your Azure Stack installation. How did you get around this issue? Thank you for your response. Are you trying to deploy on nested VM or physical server? I modified these both to ‘110’ and the install worked successfully. Thank you again for the article. It was easy to follow step by step and now I have a functional ADK lab. Thanks again! Editing OneNodeRole.xml would be something I would do as well. I’m glad you found post helpfull, that’s a reason I’m doing this, to help out.